It is the weekend, and I am in the mood for a little treat. C.S. Lewis was a slow convert to T.S. Eliot’s poetry. 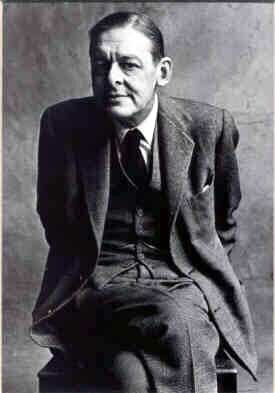 In fact, Lewis was part of an entire club dedicated to mocking the modern poetry movement that Eliot led. Slowly, the common ground between Lewis and Eliot became greater and greater. First they shared some thoughts (and good disagreements) on literary criticism. Then they were both very close friends with Charles Williams. Later in life, their 1920s conversions and love for poetry came to the point of working together on a new English translation of the Psalms. In the end, they were friends. When Lewis anonymously submitted his memoir of the loss of his wife, T.S. Eliot knew immediately that it was Lewis. He kept the secret, and published A Grief Observed under the name N.W. Clerk. Lovers of 20th century poetry will be no strangers to Eliot. I am a slow convert, but never have had the distaste for Eliot that Lewis had. I’m just a weak reader who needs better poetry muscles. But even in my weakness, there are moments in T.S. Eliot that I find sublime. Here is one of them, pulled from Eliot’s Choruses from The Rock. Here Eliot talks about today’s scattered world, how we are all “dispersed on ribbon roads.” We need one another, Eliot reminds us. This entry was posted in Memorable Quotes and tagged C.S. Lewis, Charles Williams, literary criticism, Poetry, Reflections on the Psalms, T.S. Eliot. Bookmark the permalink. “Choruses” is great — But I still maintain that his absolute best was “The Four Quartets”! I don’t think there are many who disagree, though it will be “the Waste Land” that resonates for generations–if we can all learn to strengthen our poetry muscles. Thank you for treating me to a fresh look at T.S. Eliot. Beautiful. Thanks for the note! I felt the same in rereading this (for a class, actually). I also was a slow convert to Eliot’s poetry. I recently bought his complete works and have enjoyed them very much. A heartening post! Thank you! See if you can find a library with a copy of The Rock: it is uneven, and you can (sort of) see why it was not reprinted regularly – it’s not all as good as the Choruses – but I’m glad I tracked it down – it’s well worth reading! Thank you B.D. Needed this to pass on to a confused young adult. I was not aware of that connection between Lewis and Eliot. It’s always a great story when distaste turns to grudging admiration, and then to love. Tis cool. It was hard-won. I don’t know how Eliot felt about Lewis though…. I think I remember reading some more detail about the Psalter-revising committee where Eliot and Lewis worked together in Margaret Pawley’s biography, Donald Coggan: Servant of God (SPCK, 1987), as the late Lord Coggan was the chairman of the committee. I just read that Warren Lewis entry the other day! I was struck by it. I think Lewis limited himself with old prejudices in not reading Eliot. I didn’t know about the Pawley bio. And he “read it superbly” (whichever it was: I wish I knew!) – before abruptly breaking “off in the middle”! Fascinating (and mysterious) that he refers to David Jones’s Anathemata in his “De Descriptione” lecture not so many years later – if anything is ‘High Modernist’ and, stylistically (though not in tone) like a book-length analogue of Eliot’s “Waste Land”, I’d say it was! Funny, I’m just reading that now. I hadn’t connected the three…. Wow, great! Williams read Jones’ ‘In Parenthesis’ (in think in proof, somehow: it’s mentioned in a letter, but my notes are buried…), and Jones comments on Williams’s Arthurian poetry (reprinted in Epoch & Artist) – but I’ve never found anyone who knows exactly what Jones’s acknowledgement to Tolkien is specifically concerned with! (I think it’s in the Anathemata acknowledgements…) Dr. Kranz wrote one thing and another about Jones, too, but I’m not sure if any of it’s in English.